So, you want to go mushroom hunting! Well, the best advice I can give you is don’t unless you know 100% what you are doing! I was recently invited to attend a day of mushrooms at Delheim Wine Estate and I learnt a lot! I learnt that not all pretty mushrooms are edible. I learnt that some ugly mushrooms are. I have been cooking exotic mushrooms for many years, and frankly, I think it is easier, and safer to buy them than forage for them. For more information, please contact the Mushroom Academy. Our day started off with a cup of much needed coffee before we were given a talk about all sorts of mushrooms, and where you can find them and what makes them edible, or not. Now, I am not going to share that with you as I do not want to be responsible for anyone following my advice about foraging. We then headed into the forest to forage and headed back for a talk on mushrooms by Schalk de Beer. During the talk we were served a plate of exotic mushrooms en croute. Our talk was followed by lunch and I chose the baby spinach salad with seared king oyster mushrooms to start and the risotto with dried boletus mushrooms as my main course. I tasted all of the wines on offer and I can highly rate the Delheim Chardonnay Sur Lie 2010. I was not too impressed by the shitake mushroom cookies and will be developing a biscuit recipe for Delheim at Nora’s request this week. We left with a gift bag of Nouvelle’s exotic mushrooms, and Delheim’s merlot, both of which have been enjoyed. A big thank you to Erica for extending the invitation. Tandy, this looks absolutely delicious – definitely a dish I would love. 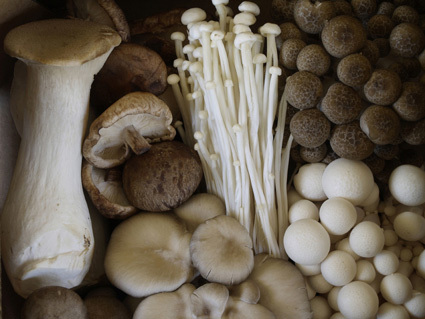 I’m with you – the only place I will be foraging for mushrooms is at my market or produce store. This looks so good! I adore gnocchi. Mmmm, blue cheese…. Were the shitake mushroom cookies savoury cookies, I hope? Wow. I know it’s wrong to crunch up my face without tasting the biscotti but I just can’t fathom cookies with mushrooms in them. I do love the idea of rich crackers made with shitake mushrooms though! WELL done!! this sounds terrific! Im a huge fan of mushrooms! Waow, that was a huge boletus! I have never tried the combination of mushrooms and bluecheese, and it sounds delish! What a wonderfully large mushroom! I’ve not had gnocchi before, but I’ve always been tempted. Great post! I mucked up my first attempt at a pasta dish for the challenge. I’m going to try again. 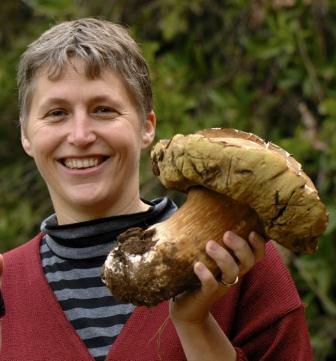 Tandy, I’m with you on this one – I think it would have been wonderful to go mushroom hunting with an expert, but even after being taught, I doubt I’d be game to eat anything I found myself! I do buy them in a pack like the ones in your photo, and adore them – love the king browns and the enoki especially. Your pasta look fabulous! It sounds like a wonderful day!! I love those mushrooms!! I have also made Gnocchi a couple of days ago – seems like we are cooking the same things – we must be connected somehow? Wow, what an interesting and fun day. Never seen that size of mushroom 🙂 Love the idea of using sweet potato for gnocchi. That is the biggest mushroom I have ever seen! It sounds like an amazing day and with wine! The recipe also looks amazing! 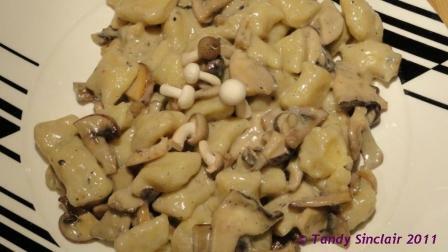 I find gnocci overrated – somehow just seems to be ‘much ado about not much’. Perhaps I’m doing something wrong? What a fascinating day! You lucky lady. The pasta sounds wonderful – I have yet to make gnocchi. The mushrooms look amazing – we have a neigbour who knows his stuff, but he´s keeping it all a secret! The gnocchi look lovely too, look forward to reeading the recipe when you´ve “perfected” it! 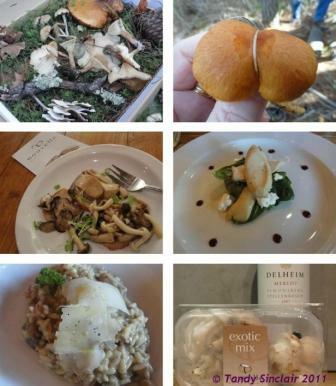 I’m definitely a mushroom EATER, but, like you…. I’ll stick to purchasing them until I can find someone I trust to take me foraging. My daughter really wants to go that route, but I’m terrified. The gnocchi with mushrooms is perfect. Thanks for sharing them and for hosting this week’s Presto Pasta Night Roundup. How interesting! That is a huge mushroom! WOW! Sweet Potato Gnocchi sounds lovely. Oh yum! this looks delicious! Am pretty petrified of making my own gnocchi (in case they come out like little golf balls), but I love the idea of your sauce. Hope to see the feedback here after you’ve gone…! for sure! I will do a blog post on my experience! WOWEE … Tandy i just LOVE the sound of sweet potato gnocchi!!! and who can resist mushrooms!! Did you make the gnocchi??? Awesome awesome recipe! Fantabulous! Ooh, better get my pasta on the boil! that must mean you are feeling better!